Friday the Thirteenth myths include stories about Kings, Popes, Warrior Monks, The Crusades, Women, Spirituality, Worship, The Knights Templar and Ancient Cultures. Is it really an unlucky day? 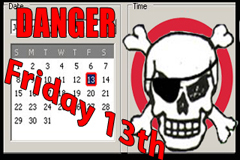 Twenty one million people in the US suffer from an irrational fear of Friday the Thirteenth causing an estimated loss of revenue to business of nearly nine hundred million dollars. It may be more unlucky for women than men.